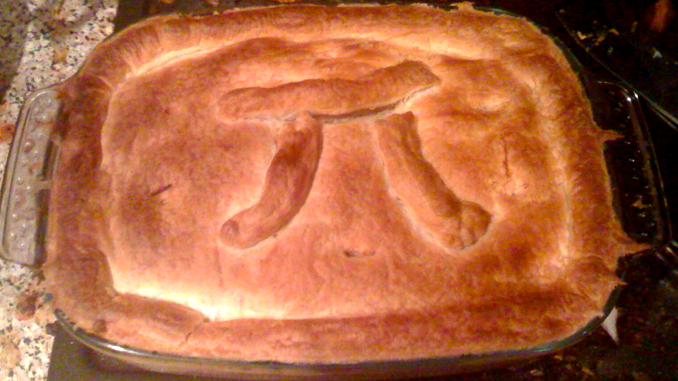 Picture of a Steak and Ale Pie, with a Pi symbol on the top. Photo by Gazimoff. There’s useless knowledge, and then there’s famously useless knowledge. The memorization of pi ranks highly in the category of famously useless knowledge. It’s got its own day (March 14), it has books that consist of recitations of the digits in its irrational and transcendental self… in other words, it goes on forever and doesn’t repeat digit groupings. It’s a useful constant in physics and math. The number itself has significant value. The memorization of it? Not so much. Nevertheless, there are records kept and challenges met. There’s Akira Haraguchi, who claims to have memorized it to more than 100,000 digits but who has not done so for certification. There’s the official world record holder Suresh Kumar Sharma, who made it through 70,030 digits in 2015. And there is are yearly competitions on Pi day. This all makes sense to people who like to work toward a challenge. Unlike many challenges, the greatest physical danger in reciting pi is that you’ll fall asleep while doing it… most of the recitations take over ten straight hours. But it’s a lot of effort with comparatively little payoff. Unless you’re making a song about it. Question of the night, apropos to the upcoming Thanksgiving holiday… what’s your favorite type of pie?